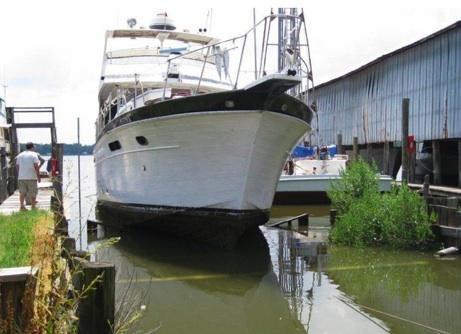 May 2015 Update: Chesapeake Mobile Marine is no longer affiliated with or located at the marina. "I'm back to full time mobile work at your location or mine. Reasonable rates and quality work 443-404-1343 Sam"
Founded in April of 2011, Chesapeake Mobile Marine is a full-service boat yard located next to the Dockside Restaurant and Blue Heron Pub and the Colonial Beach Yacht Center. If you've got a boat, check this place out. Sam Leonard is the man running the show. If he's not working on a boat you'll most likely find him in a nearby small portable office building which has shelves stocked with lots of boat-care products from manufacturers like Marpro, Interlux, Pettit paints, Quicksilver, Marpac, Lenco, Camp, Charles, Taco, Farecla, Taylor Made, Blue Sea, Rule, Jabsco, Aqua Signal, CDI, NGK, Standard Horizon, Star Brite, Shakespeare, Perko, Teleflex, Bennett, Sierra, Solas, Moeller, Optronics, Garelick, Airhead and 3M. To get to this location, travel like you're going to Dockside, then keep right and look for the tan construction trailer. This is the office/store. There's a trolley stop in the parking lot, so you can use that to get here in the spring and summer when it runs.